It is expected to resolve the vast majority of the Charlotte, North Carolina-based bank's remaining liabilities tied to its purchases of Countrywide Financial, once the nation's largest mortgage lender, and Merrill Lynch. "This historic resolution—the largest such settlement on record—goes far beyond 'the cost of doing business,"' U.S. Attorney General Eric Holder said in a statement. Chief Executive Brian Moynihan has spent more than four years trying to rid Bank of America of liabilities from the purchases of Countrywide and Merrill, which were made by his predecessor, Kenneth Lewis. In a statement, Moynihan said the accord is in shareholders' best interests. 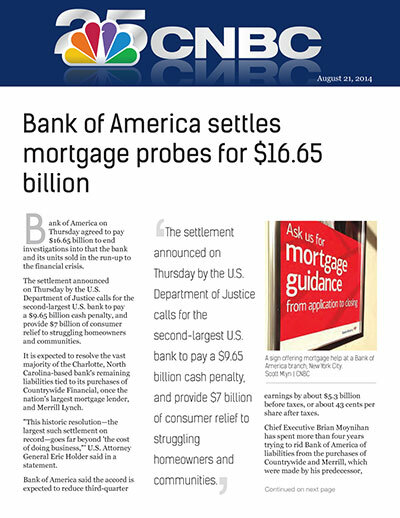 The settlement's outlines had surfaced earlier in the month, and the formal announcement may increase the chance that many of the bank's mortgage problems are behind it. It does not cover the $1.27 billion fraud penalty imposed last month by a federal judge over a fraudulent Countrywide mortgage scheme known as "High Speed Swim Lane," or "Hustle," which Bank of America is appealing. The accord also does not cover potential criminal claims or claims against individuals.